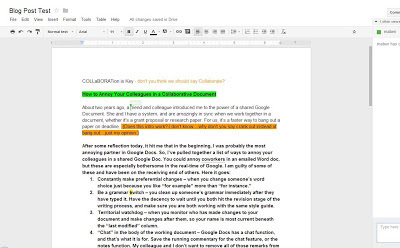 About two years ago, a friend and colleague introduced me to the power of sharing Google Drive documents. She and I have a system, and are amazingly in sync when we work together in a document, whether it’s a grant proposal or research paper. For us, it’s a faster way to bang out a paper on deadline. Be a grammar witch – you clean up someone’s grammar immediately after they have typed it. Have the decency to wait until you both hit the revision stage of the writing process, and make sure you are both working with the same style guide. Be a territorial watchdog – This happens When you monitor who has made changes to your document and make changes after them, so your name is most current beneath the “last modified” column. 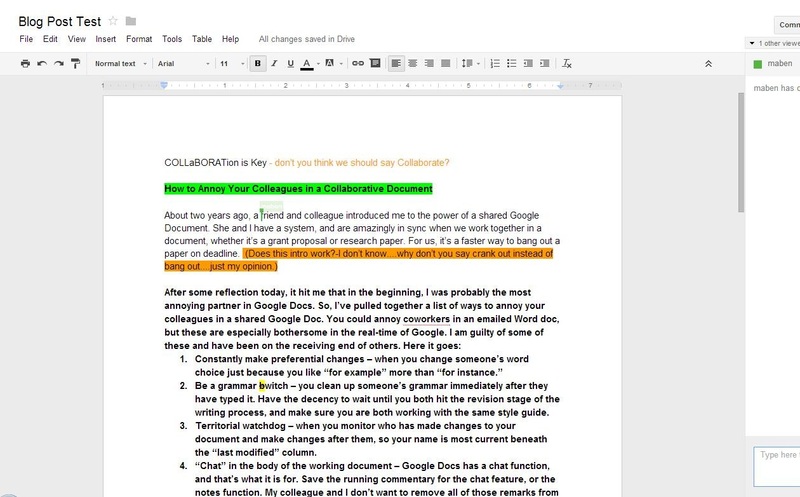 “Chat” in the body of the working document – Google Docs has a chat function, and that’s what it is for. Save the running commentary for the chat feature, or the notes function. My colleague and I don’t want to remove all of those remarks from our document. In many cases, we create our pdf directly from Google Docs for submission. Don’t give any instructions to new collaborator to your document – They will be lost and you will have to clean up their additions that might be off target or topic. Make sure new collaborators have been given the same courtesy of instruction as the original collaborators. Quietly stew and don’t ask questions or speak your piece– Even with the chat function, some brainstorming and organization may be lost in the written word. A quick phone call or Google Hangout at the beginning or end of a session can quickly shore up any unresolved project issues. Simply hover while the other party works – If you don’t have anything to offer in a particular section, find a section of the project where you can contribute. Don’t let a minor detail go – Like any project, you can get bogged down in minutia in a Google Doc. Use a note to mark the issue and keep working. Once you finish the first draft that issue may be resolved itself, or may seem much smaller. I’m proud to report that I’m somewhat reformed, although No. 2 gets me sometimes still. A lot of it comes down to suppressing the control freak within to truly collaborate. Which ones are your tops? Or what would you add to the list? Dr. Sarah Maben is co-director of the Texas Social Media Research Institute and an editor for The Journal of Social Media in Society. She teaches journalism and public relations courses at Tarleton StateUniversity. Follow her on Twitter @SarahMaben.